Proud Galleries’ new exhibition celebrates the legacy of Audrey Hepburn on the 25th anniversary of her death. 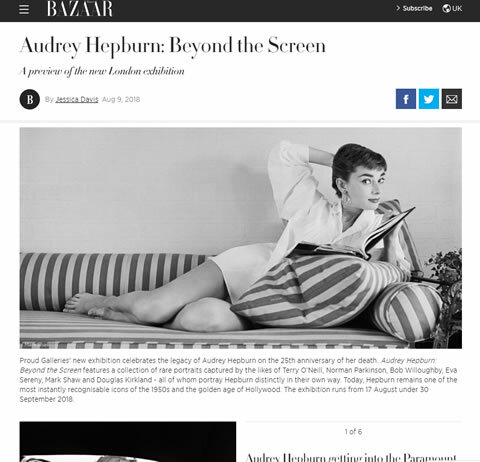 Audrey Hepburn: Beyond the Screen features a collection of rare portraits captured by the likes of Terry O’Neill, Norman Parkinson, Bob Willoughby, Eva Sereny, Mark Shaw and Douglas Kirkland – all of whom portray Hepburn distinctly in their own way. Today, Hepburn remains one of the most instantly recognisable icons of the 1950s and the golden age of Hollywood. The exhibition runs from 17 August until 30 September 2018.